Inspiring Success Story of Patricia Narayan - From a mobile cart to 14 restaurant outlets. 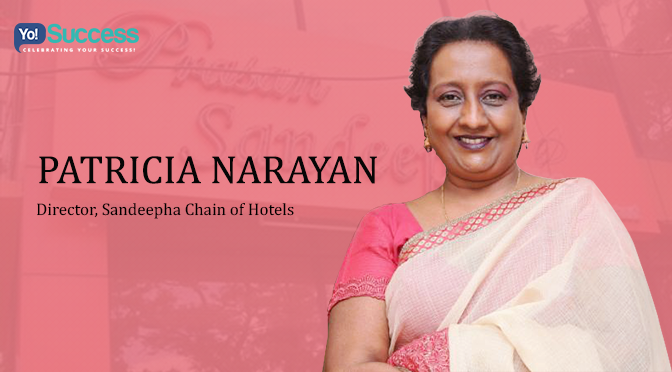 Meet Patricia Narayan – Director, Sandeepha Chain of Restaurants based in a city that simply adores food, Chennai. A proud winner of “[Federation of Indian Chamber of Commerce and Industry] “FICCI Woman Entrepreneur Award” (2010); after successfully fighting all the odds of failed marriage, addict husband, and taking care of two kids, lives in a well-furnished duplex apartment in Velachery with a shining luxury car parked outside the door. Whatever happened in Patricia’s life which led to her entry into the world of entrepreneurship was evidently not a planned one but was more due to the twist in circumstances that life threw before her. Instead of cribbing and living in problem she successfully transformed her life into a more meaningful and inspirational tale for the world to look back at. Patricia early life was like a typical Bollywood movie scene! Patricia’s family consisted of her father who worked in the Posts & Telegraphs department and her mother in the Telephones department — along with her two younger siblings, who were based in Santhome. Soon she fell in love with a boy who was 13 years elder than her and was a Hindu and decided to marry him! They quietly got married at the registrar’s office. They decided that she would finish her college first and then break the news to her parents. But within the three months of her marriage, his husband started putting pressure on Patricia to come out with him and he was constantly threatening her that if she didn’t tell her parents about their marriage then, he would. Without much of a choice, she disclosed the news and faced all the heat from her parents. Soon the news also spread amongst her relatives and the only solution to control the damage was to have the couple socially married. And having said that; the couple took the vows in a Purasaiwalkam church, after which both the families disconnected ties with them. Hence, Patricia moved into a rented house in Anna Nagar with his husband, only to realise that life was nowhere close to a Mills & Boon story and was just a big bloat of disaster. She figured that she had become pregnant by a husband who was heavily into alcohol and drugs, had no money to survive and had no intentions to earn as well. To make things worse; she wasn’t able to bring him out of the addiction and got beaten up almost every other day. Now with no money, no earnings and two small kids, she was left stranded without a roof and had nowhere to go. That is when her father, who although still never forgave her, but he gave Patricia, her husband & two children a refuge at his place. Her husband remained sober during the day, but at night would become abusive and brutal if he did not get money to take care of his cravings. Luckily, Patricia’s father worked night shifts and barely got to see this side of Narayan. But the question of earnings still remained unanswered. It was a question of survival for her. It was either surrender to the burden or stand-up and fight. And in a lonely batter, she decided to fight! Now even though cooking and new dishes always caught her interest and passion but because she came from a family of government servants, the thought of becoming a business woman never clicked to her mind. But at the same time, she also didn’t want to be a burden on her parents. So as a first; to at least make some use of herself, she borrowed a couple of hundred rupees from her mother and started making squashes, jams and pickles at home: her mother took them to office and sold them to her colleagues. She sold everything that was made in one day itself, which boosted her confidence even more. The income seemed to be ideal to start off with! She valued every penny that she earned and like a true businessperson, Patricia invested all that she earned to make more pickles, squashes and jams. And just about when fate thought she was ready, another opportunity presented itself! During those days, her father’s friend, who ran a school for handicapped children, was giving out free mobile carts or kiosks to anyone who would employ at least two handicapped people and a similar deal was offered by him to Patricia as well. And she willingly took it! All she had to do was, train the handicapped children to make coffee and serve them to customers. She had seen quite a lot of people crowding in the evenings near the Marina beach – where she lived; hence, she decided to put the mobile cart at the Anna Square on the Marina beach. But before that, most timing consuming and tedious work was to get the permissions from the Public Works Department (PWD) which took upto one year. Anyways, finally, the big day arrived and she began working on June 21, 1982! Since the previous night itself, she got the mobile cart rolled out to the beach with the help of the local rickshaw drivers. Now at that time, carts like that of hers; sold only tea and cigarettes, but Patricia decided to take the innovative route and included cutlets, samosa, bajji, fresh juice, coffee and tea on her menu too. To her surprise, on the first day she sold only one cup of coffee and that was for fifty paisa! This disheartened her completely! That is when her mother consoled the crying Patricia, and said that there is no reason for you to discontinue, at least you sold one cup of coffee; that’s a good sign. You will do well tomorrow! And clearly, she was a big hit next day. She sold snacks worth Rs. 600-700! As she started making more money, she also included ice creams, sandwiches, French fries and juices too. She never felt scared of the night and made sure that she was personally present and sold all the stuff she made. She had a burning fire within her which made her keep going, made her believe that she wasn’t a failure and that she could also be successful without anyone’s help. She continued running this cart from 1982 to 2003! She used to be open from 3 pm to 11 pm every day, and later started opening it from 5 am to 9 am for the walkers. The maximum she ever made from the cart was Rs. 25,000/day. That was during the bandh days! This is when the second jump made its way to her! Meanwhile, she unknowingly had turned the spot light on her. Even though she didn’t realise but someone worth, saw her work at the beach; that person was the Chairman of the Slum Clearance Board! Seeing her work, she gave Patricia an offer to run the canteen at their office with a proper kitchen and setup. Goes without saying, she accepted the offer; but moreover, she turned it into a huge success! She used to get up at 5 am in the morning, make idlis and go to the beach, from 9 am she would be at the canteen, and then from 3.30 pm onwards she would again get back to the beach cart till 11pm. Patricia now had employees to cook, clean, and complete every other task, which altogether happened at the canteen kitchen. And by now she was also making a decent monthly income of around Rs 20,000. Every Wednesday, used to be a public grievance day, so about 3000 people used to come there and she got thundering business. Her work turned out to be so good that, in some time she got another offer to run the Bank of Madurai canteen, wherein she got the opportunity to serve roughly 300 people daily. And with that, she stopped running the canteen at the Slum Clearance Board. Like they say: “Every Problem Brings an Opportunity with Itself”, similarly, Patricia’s time was about to change, too! One day, after a usual fight with her husband, a frustrated Patricia, got into a bus and took a trip till the last stop. Coincidently, the last stop turned out to be the National Port Management training school which was run by the Central government. Without a thought further, she entered the premises to meet the administrative officer. During the meeting, she told him that she was a caterer and she bluffed that she had heard they were looking for one. And to her surprise, due to problems with the contractor, they in fact were looking for one! Obviously, the genius that she was, got the offer; but what was even better was the perks that came along! She now had to serve three meals to about 700 students, daily and she also got her own quarters to stay by them. And it was successful from day one! Her first weekly payment was Rs. 80,000 which soon went on to become Rs 1 lakh/week, an amount, far more elevated than earlier. By now she had become a pro at what she did best, she exactly knew how to manage things, run things, and smoothly delegate & execute things effectively. In the year 1998, she was offered a partnership in one of their units by the Sangeetha Restaurant group. 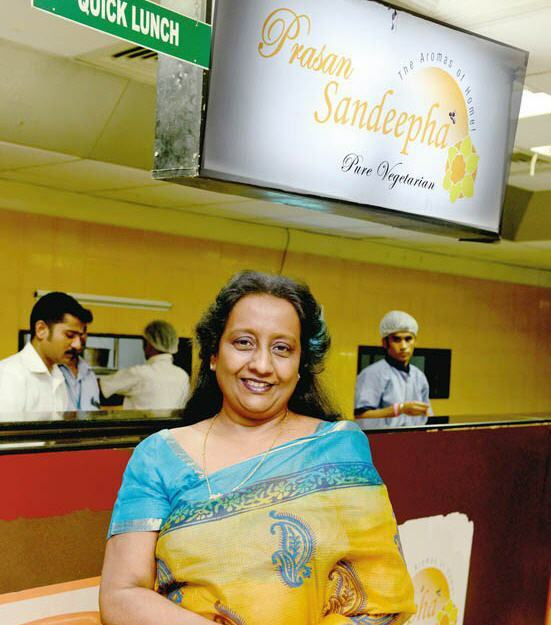 But her son, Praveen Rajkumar wanted her to start her own restaurant and build a brand of their own. Just when happiness was beginning to make space, a huge tragedy took place in their life! She lost her daughter – Pratibha Sandra and her son-in-law in a road accident, a month after they got married in 2004. This shattered Patricia and broke her into pieces; she withdrew herself from all that she was doing. She just wasn’t able to get over her daughter’s death! What had shocked her even more was the way the accident victims were treated by the ambulance operators. When they found that all the four in the car were dead, they just simple refused to carry the dead bodies. Finally, somebody came forward and carried all the dead bodies in the boot of a car. And when Patricia saw the bodies being taken out of the boot, she just broke down. No human, especially a mother could bear such a scene! That is when her son decided to take responsibility of everything and started their first restaurant in the loving memory of her daughter ‘Sandeepha’ in 2006. Although, it did take some time for her to come out of the shock, but with time she did come back and started helping her son in the business. She also purchased an ambulance and decided to keep it on that very spot – Acharapakkam, to help people whether the victims are alive or dead. And since then there has been no looking back for her and her business! Patricia, who began her career into entrepreneurship 30 years ago by selling eateries from a mobile cart on the Marina beach with just two people & 50 paisa/day, today has more than 200 people working directly under her & makes Rs. 2 lakhs/day in sales collectively, from 14 outlets of Sandeepha. And with that her lifestyle has drastically changed too! A woman who once used to travel in a cycle rickshaw, moved on to riding in auto rickshaws, now owns luxury cars. Today, her work, experience & life speaks in such loud volumes that, she can give ‘Chicken Soup for the Soul’ a run for its money by writing self-help books on how to survive in spite of being surrounded by hardship. Always stick to what you know. Believe in yourself and the product you are making. You should know what you ask your employee to do. Struggle makes you even more mature to retain the success for a long time. Success isn’t a status or possession that stays with you for lifetime, or a permanent stoppage of an accomplishment, it is rather a constant journey where you have to maintain your consistency. Pain is an inevitable part of life and it shouldn’t stop us from moving forward as – ‘moving is life’ and ‘still is dead’. To be a successful entrepreneur, you don’t have to be highly educated (as degree doesn’t always ensure success). You need a genuine desire to trust your vision to accomplish your dream anyway and anyhow, determination to create an opportunity out of adversity, honesty towards consistency on the rough way of destiny and patience to reach it and taste it.